After 301 people were confirmed dead in Turkey’s single worst mining disaster last month, critics blamed Recep Tayyip Erdoğan. The Turkish prime minister’s business-friendly government had privatised the mine in Soma and its inspectors had given a clean bill of health just weeks before disaster struck. Mr Erdoğan’s supporters tried to shift the blame elsewhere. Their principal target was the mine’s owning company and its director Alp Gürkan. Among the many personal attacks on Mr Gürkan in the pro-government press, one headline was distinctive: “That boss’s son-in-law is a Jew”. For the pious daily YeniAkit, a board member who changed his name from Mario Asafrana to the more Turkish-sounding “Mahir”was sufficient for a front page splash. It is the latest in a list of recent anti-Jewish slurs in Turkey. 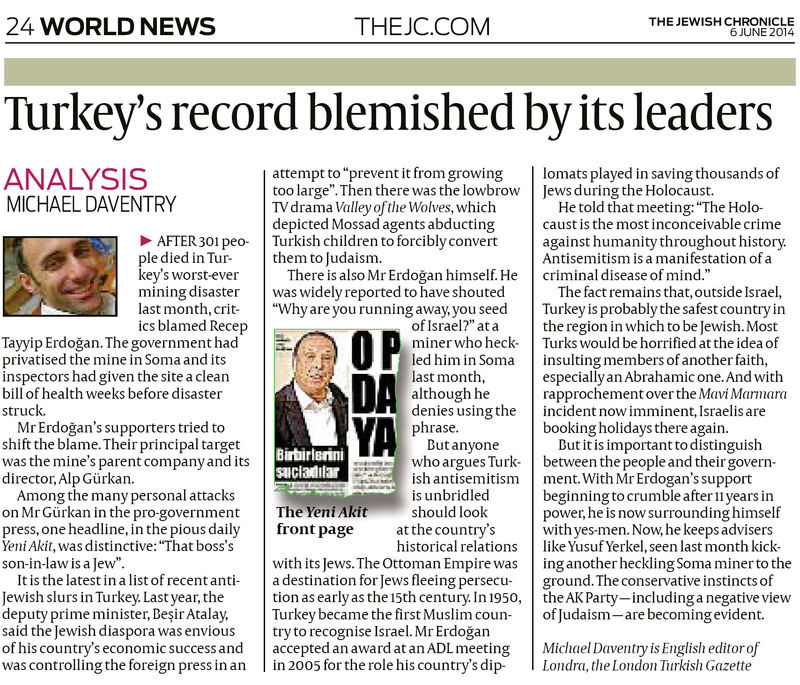 That list includes the deputy prime minister Beşir Atalay, who last year said the Jewish diaspora was envious of his country’s economic success and was controlling the foreign press in an attempt to “prevent it from growing too large”. Then there’s the culture association in the central Anatolian town of Eskişehir, with the sign outside its building reading: “Dogs may enter, Armenians and Jews may not”. And the lowbrow television mafia drama, Valley of the Wolves, which depicted Mossad agents abducting Turkish children to forcibly convert them to Judaism. Then there’s Mr Erdoğan himself. He was widely reported to have shouted “Why are you running away, you seed of Israel?” at a miner who heckled him in Soma last month. He denies using the phrase, though the fact it gained such traction shows many believed the words were his. But anyone who argues Turkish anti-Semitism is unbridled should look at the country’s long history of relations with its Jewish population. The Ottoman Empire was a destination for Jews fleeing persecution from Europe as early as the 15th century. In 1950, Turkey became the first Muslim country to recognise Israel. Mr Erdoğan himself accepted an award at an Anti-Defamation League meeting in 2005 for the role his country’s diplomats played in saving thousands of Jews during the Holocaust. He told that meeting: “The Holocaust is the most inconceivable crime against humanity throughout history. Such is the confusion over Turkey’s relations with Jews that its prime minister can simultaneously be associated with Holocaust condemnation and crude anti-Israel slurs. The fact remains that outside Israel, Turkey is probably the safest country in the Middle East in which to be Jewish. Most Turks would be horrified at the idea of insulting members of another faith, especially an Abrahamic one. And with rapprochement over the Mavi Marmara incident now imminent, Israeli tourists are booking holidays there again. But it is important to distinguish between the Turkish people and their government. The prime minister won power on a platform of unity, bringing together Turkey’s myriad social classes, ethnicities and faiths. That coalition is crumbling, partly because some are feeling “Erdoğan fatigue” after his eleven years in power, and partly because Mr Erdoğan is surrounding himself with advisers who are not brave enough to challenge him. Gone are the people who persuaded him in 2004 that criminalising adultery was a terrible idea. Here now are advisers like Yusuf Yerkel, pictured last month kicking another heckling Soma miner to the ground.The most fundamental conservative instincts of the AK Party leadership, including an inherent suspicion of Judaism, are shining through unhindered. This article was originally published in the Jewish Chronicle on Friday 6 June 2014.